Let me start right off the bat by stating that I am not a certified accountant. This post is not offering financial advice. As an artist, I don't even know that I'm allowed to talk numbers and statistics. But I can speak to imagination and ideas. 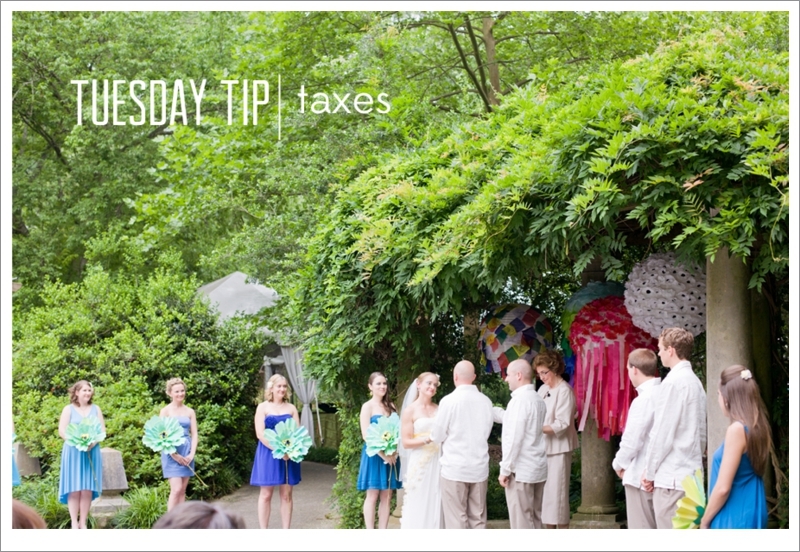 The wedding tip this week is simply to bring to light a few ideas that might be helpful for you in another 364 days. Though you should bring these ideas to your accountant to make sure they are proper and lawful before proceeding. Hopefully the huge weight of filing taxes is off your shoulders as of yesterday. As we're now in the midst of a new tax year, I began doing a little research to see if there are parts of your wedding that you can deduct. When approaching this subject, I like how eHow contributor Christa Titus gives the following warning regarding writing off wedding costs in an online article: "Consider whether you are willing to endure an audit for your attempted deductions. Quirky write-offs are red flags for the IRS." Although getting a tax deduction is perhaps the last thing you're thinking about while picking out the perfect dress, wedding write-offs may be something to at least consider when it comes time to file next year. One of the biggest things eHow contributor Wendy Rose says in her online article to remember now is to get documentation. "Whether you have your taxes done by a professional accountant or take care of them yourself," says Rose, "it's important to document each of these wedding tax write-offs. Keep all your receipts for any purchases you make and request a donation sheet (signed by the organization) that states how much you donated, what you donated and when." Even if you don't file any wedding-related deductions, at the very least it's good to think about a way for even more people to enjoy those beautiful flower arrangements someone so carefully created. Think about how much it would brighten up a nursing home! Or what if you arranged for any leftover food to be taken to a shelter? That could really make someone's day! 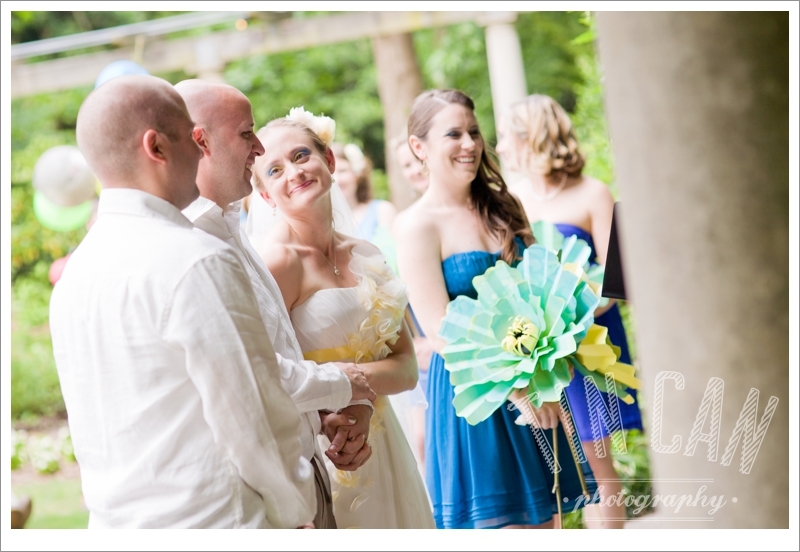 A venue in Atlanta we love because of the way they give back is the Cator Woolford Gardens. 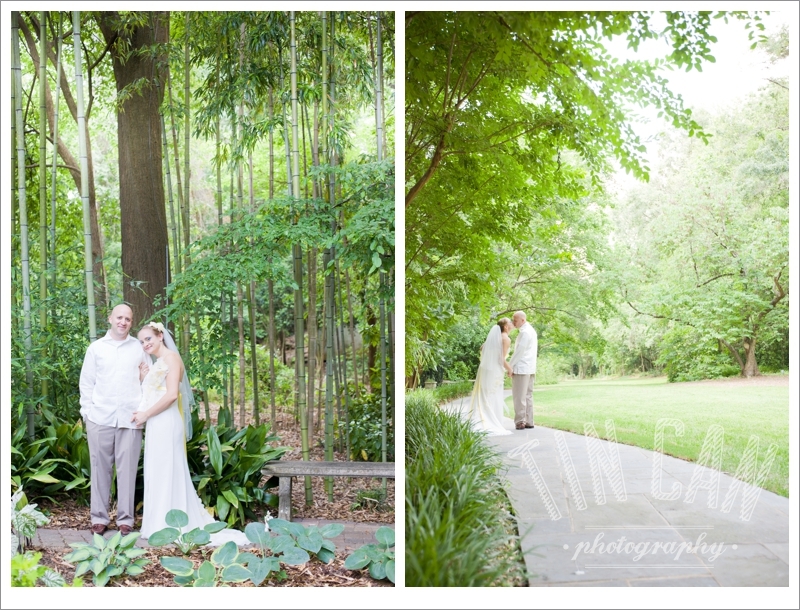 Hidden among 39 acres of hardwood forest right in the city, these gardens are a beautiful setting for a wedding. And maybe even more beautiful is the fact that most of your wedding rental fee is given to the Frazer Center to help fund programs for children and adults with developmental disabilities. Talk about a wedding fee you can feel really great about! Again, please work with a certified professional if attempting to write off any wedding-related expenses (or just in general because they know what they're doing and can really save you some stress...and hopefully a little money too! ).